Home › Blog › Can Women Succeed in the NFL? Jen Welter was the NFL’s first female coach. To understand where the NFL is going when it comes to women—which is a better, more progressive place—you have to understand where it’s been. You have to know that there are female heroes from the NFL past who shaped the NFL present. You have to hear the story of five naked players standing in a locker room, exposing themselves to a female executive. That woman was Susan Spencer, and it was the late 1980s. Spencer is a little-remembered part of NFL history but was vital in that she was a bridge from the past to present, a period of massive positive change for women in the NFL. She was the vice president, legal counsel and acting general manager of the Philadelphia Eagles. To this day, she remains the only female general manager in league history. One afternoon, Spencer went to the team’s stadium to see some new rehabilitation equipment. The area where the equipment was located could only be accessed through the locker room. She normally didn’t go into the locker room, feeling it was the players’ sanctuary. But it was the offseason, and players weren’t expected to be there, so she went inside. She entered the room, and there were five naked Eagles players standing there. They had just emerged from the shower. Each of them quickly grabbed nearby towels. But then one of the players—a Pro Bowl cornerback—had a different idea. He told the others, “On three, drop your towels. One, two…” The towels dropped. It was a masterful play. The teammates laughed at the player. Spencer had successfully turned the table. For the remainder of the season, Eagles players referred to the player as “Big Deal.” It was his new nickname, and it wasn’t meant as a compliment. This story is funny, sure, but it’s also important. Women like Spencer fought mostly forgotten battles to help get the NFL to where it is, a point where the sport is seeing more advancement for women than ever before. They laid the foundation. A series of public-relations debacles involving league-office and player treatment of women in recent years have spurred the league to build on that foundation. It’s given us the Year of the Woman. The NFL and its teams have enacted a series of initiatives and hires—sincere ones—leading to more advancement throughout the NFL hierarchy for women over the past year or so than the previous 50. In February, the league took a huge step, expanding the Rooney Rule to include women. 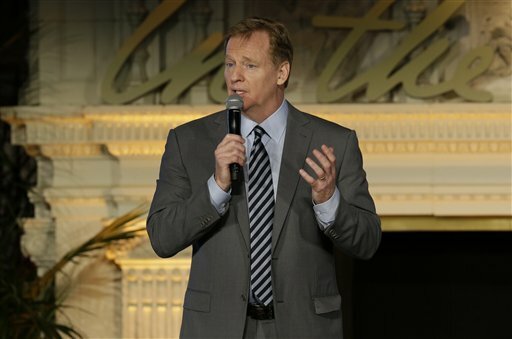 Roger Goodell announced it just prior to the Super Bowl, at the league’s first-ever women’s summit. Now, the league office must interview a woman—as well as a minority—for an open position. There are 31 women in the league office at the vice president level and above, according to the NFL, including senior vice president of public policy Cynthia Hogan and chief marketing officer Dawn Hudson. The NFL says 30.2 percent of league-office employees are women and 26.5 percent of all vice presidents at the league office are women. When Ray Rice was initially suspended just two games for his heinous act, there were no women as part of that decision-making process. If that situation had happened now, there would be multiple women involved in deciding what action to take. It’s likely the NFL will attempt to expand this part of the rule to individual teams in the near future, but ESPN analyst Louis Riddick does issue a wise note of caution on that front. Many of the positive changes have been made at the league office. On the team level, advancement of women lags behind. Translation: Roger Goodell has a great deal of control, and he has the will to make substantial additions of women in the league office. On the team level, though, owners rule everything. There are signs of progress with team hirings, too. Sarah Thomas became the first woman to be hired as a full-time game official last April. The Cardinals made Jen Welter the first female coach in July. The Jets promoted Jacqueline Davidson to director of football administration in August. The Bills hired the first full-time female assistant coach, Kathryn Smith, in January. The Texans made Amy Palcic senior director of communications in February. It’s not just the top jobs that are starting to diversify. You can see it on the sidelines during games. There are clearly more women as part of teams’ medical and training staffs. Things are progressing so quickly with women in the sport, there is some belief among team executives and assistant coaches that there could be a female coordinator in five years and a female head coach in 10 to 15. Just a few years ago, such a notion was inconceivable. Eight veteran NFL players were polled by Bleacher Report, and seven said they wouldn’t care if a woman was a coordinator or head coach. One said he was undecided. College players at the scouting combine seemed almost offended when asked if a woman could be a head coach either in college or the NFL. Consider this: Journalist David Schwab pointed out after the Super Bowl that 52 million women watched. Fifty-two million. There’s not a lack of interest from women in the game. So why would only one be an assistant coach right now? Because of experience? Not only did many NFL head coaches or assistants not play in the pros, but there’s a significant number who never played any football at any level. Some were never athletes of any kind. “Teams don’t have a problem with women in the front office on the business side,” she says. “The problem becomes when women want to get involved in football decisions. The owners don’t want women making those decisions. When listening to the stories of the NFL’s female pioneers, it becomes clear just how much they had to overcome. The Jets hired Connie Carberg in 1974, mostly to be a secretary. She became the first female scout in league history in 1975. Just four years later, she was asked to find a replacement for an injured player at the Senior Bowl. She scoured the film and found one—his name was Mark Gastineau. Years later, when Gastineau was inducted into the Jets’ Ring of Honor, he invited Carberg. Carberg says she never had a single issue with a coach or player. She traveled with the team extensively. But when Leon Hess became sole owner of the team, the travel stopped, because Hess didn’t want a woman traveling with the team any longer. Much of the NFL culture in Spencer’s era was still anti-woman. Players committing acts of violence against women faced little or no punishment. When Spencer attended league meetings, she remembers that occasionally owners—married and unmarried—would slip notes under her door or knock on it. Sometimes, the notes and knocks would go late into the night. She ignored them. Spencer was the daughter of the team owner, Leonard Tose, but she was a mentally strong woman who wanted to find her own way. She entered Villanova University School of Law when she was 35, and by her second year of law school, she was working for the team as its legal counsel. As she began mining some of the team’s financial data, she noticed the Eagles were spending themselves into oblivion. Many team officials ignored her. Even her father didn’t listen to her, which was a mistake, as Tose would eventually be forced to sell the Eagles. But before that, for years, Spencer would run the daily business operations of the Eagles. Amazingly, this wasn’t officially made public at the time, because her father, like many men of his generation, believed a woman belonged at home watching the kids and didn’t want people to know she was running the team. Yet the word would eventually get out after Spencer enacted a series of initiatives to keep the team financially solvent. She contracted with a regional aircraft company to get a smaller plane that only held players and team personnel (instead of the families of team personnel and the media a larger plane held). She raised ticket prices, and she replaced expensive lobster and filet mignon in the media dining area at Veterans Stadium on game days with cheesesteaks and hot dogs. The truth is, the measures Spencer took to save money, and modernize the way the Eagles made that cash, were ahead of her time. They are common techniques now. It wasn’t appreciated, however, in the moment. When she once was a guest at Philadelphia’s Maxwell Football Club, and introduced, fans stood up and roundly booed her. It was so bad that George H.W. Bush, who was there, approached her afterward. To Amy Trask, this issue is not extraordinarily complicated. It’s easy to understand why she feels this way. She was hired by the late Al Davis. When it came to both issues of race and gender, Davis was the most progressive owner in the history of sports, hiring the first Latino and African-American coaches, and the first female team executive, Trask. When asked what percentage of chance a woman becomes commissioner, head coach or coordinator in the next 10 years, Trask responds: “I am not a fan of ascribing percentages or odds, so I will share my thoughts descriptively, rather than numerically. I believe it is possible that a woman will be named commissioner during the period you referenced. Is it likely? I don’t know that it is likely, but I believe it is a viable possibility. What’s certain is that the NFL overall, after decades of mostly treating women shamefully, is undergoing a historic transformation. Team officials echoed Trask’s words in that they believe the NFL will have a female commissioner before a female head coach. They point to the lack of women in the coaching pipeline. The number—currently one—can grow rapidly as the idea of women in coaching becomes the norm. The same way, decades ago, the idea of women as senators and governors stopped being unusual. There will be a woman head coach in the NFL. The process to become a head coach in the NFL at all is a long process, though. So we’re just now seeing the door opened. I know females who are head coaches of women’s football teams. There’s a great one with the Pittsburgh Passion, which has a phenomenal tradition. Odessa Jenkins, my former teammate, is the head coach and one of the owners of the Dallas Elite. Keke Blackmon is the head coach of the Kansas City team. Knengi Martin is head coach of a high school football team out in California. These are all women who I came up in the game with. You need that experience. When you have that at that level, it will translate into upper levels, there’s no question in my mind. It will happen. It’s going to take a while. One front-office executive, who has been in the NFL for decades, issued caution when it comes to women on the team level. He doesn’t believe owners will move as quickly as the league has. “We won’t see a woman head coach in my lifetime,” he said. A constant in talking to the NFL women of the past is how they kept their sense of humor intact despite facing prejudice and double standards. Spencer recalled when an Eagles player separated his shoulder, and the medical personnel were having a difficult time popping it back in. Spencer, who stands 5’4″ and weighed just 100 pounds, was asked to climb on the player’s shoulder and jump on it to pop it back in. It worked. ‹ Stan Davis, Rancho’s 2015 Defensive Coordinator , has been promoted by Coach Pletsch, as Rancho Football’s Head Coach!